In our warm Southern California climate you might find that some roofs you’ve had installed end up lasting as little as 1/3 of their expected lifespan. The combination of warm weather and the close proximity to water and sea salt wreaks absolute havoc on many different types of roofing materials. It’s because of this reason that tile roofing has become such a popular choice for our Los Angeles customers and those in the surrounding areas. Tile roofing offers two major benefits. The first is a durability that is arguably unmatched for almost any other material type in the roofing industry. Roofing tiles are thick, heavy, and sturdy which makes them resistant to all sorts of weather elements. The second beneficial aspect of using a tile roof is that you achieve this durability without sacrificing style. Tile roofs mesh perfectly with the abundance of Spanish or Mediterranean style homes that adorn L.A but provide great aesthetics on a number of different architectural designs as well. If you are to have tile roofing installed instead important to go with a trusted pro like Rooftoppers. First off, you want a professional installation so that you can achieve the full benefits of the long life span of tile roofs. Also however, since tiles are so heavy and often require additional structural support built into your roof, you want a company knowledgeable and experienced in this process. Rooftoppers has been in the tile roofing business since 1983 and have performed over $75 million worth of business in Southern California alone. 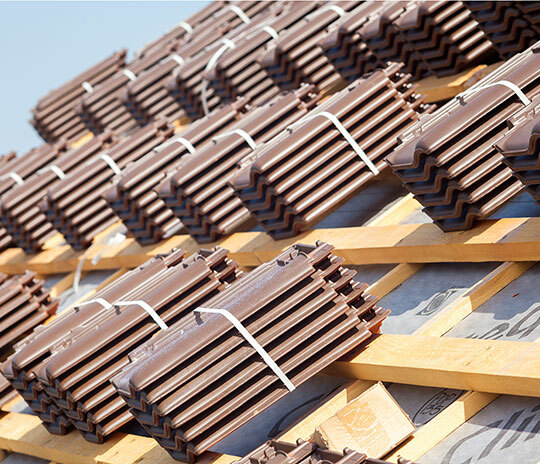 Tile roofing involves installing thousands of individual pieces one at a time. It is a very intricate procedure that requires a roofing professional. The tiles themselves can be manufactured from a variety of natural materials and can be outfitted with any number of different glazes and finishes. The tiles are very heavy which gives them their durability. The natural smooth and hard finish of tiles also gives them supreme watershedding ability not to mention great thermal properties. Tile roofing is a very broad term mostly because there are so many material types of tile available. Some of our most popular choices include terracota or slate but can also range from concrete to clay to plastic. The modern manufacturing practices of roof tiles allow them to be produced in shapes that mesh with any building design. Tiles can be manufactured in the traditional barrel styles or can be created to emulate wood, stone, and other materials. S-style clay roofing styles are a popular option as are flat rectangular interlocking tiles. Because of the manufacturing flexibility a tile roof is one of the most customizable and versatile types of materials in the roofing industry. Resistance to rain, hail, and high winds unlike any other material.